Save on AJ Hackett Bungy NZ experiences with SkyBus. Add an AJ Hackett Bungy NZ experience to your SkyBus airport transfer ticket and save. Looking for an adrenaline filled thrill? Unique experience? Breathtaking view of Auckland? SkyBus has partnered with AJ Hackett Bungy NZ to offer you four fantastic Auckland adventures at a fantastic discounted price. AJ Hackett are the Bungy originals – they’ve been doing this stuff for 30 years and their crew is the most experienced in the world. For more information, including locations, contact details and safety information, visit the AJ Hackett Bungy NZ website. under the Auckland Harbour Bridge. Jump solo, jump with a friend, or try New Zealand’s only ocean touch. 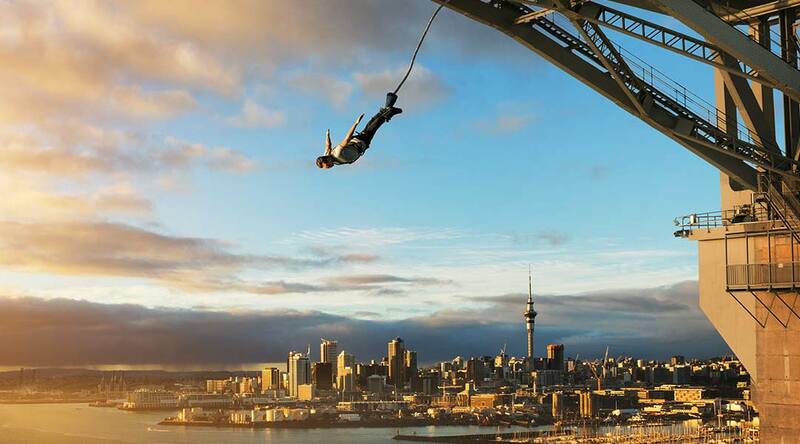 Auckland Bridge Climb – New Zealand’s only authorised bridge climb, an easy-going, fully guided and fun tour right to the top for amazing 360 degree views. Auckland SkyJump – The ultimate leap of faith, a jump from New Zealand’s highest building with nothing but a wire between you and the ground 192m down! 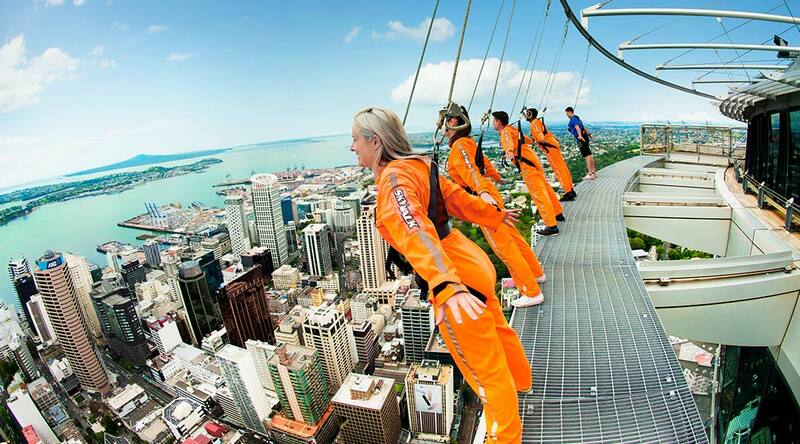 Auckland SkyWalk – Take a walk on the wild side at the top of New Zealand’s highest building. Epic 360-degree views await your at the top, 192m over Auckland city. Once an AJ Hackett Bungy New Zealand product has been booked and paid for, this product is non-transferable and non-refundable. If you have any questions regarding this policy or your booking then please feel free to contact us on any of the contact details below. If children under 10 require transport, please contact the AJ Hackett Bungy NZ Call Centre. If you have opted to use your own transport please check in at our Base Building, 105 Curran Street, Westhaven Reserve, Herne Bay, Auckland. Free Parking is available on site. If you have opted for our transport please be waiting outside the Auckland Sky Tower (on the corner of Victoria and Federal Street) 10 minutes before the booking time. Children aged 10 to 14 years old must have a parent or guardian co-sign their declaration and waiver. If you are booked on as an Auckland Spectator the above will apply. Children aged 7 to 14 years old must have a parent or guardian co-sign their declaration and waiver. SkyCity Parking available - reduced rate with validated ticket. Children aged 10 to 14 years old must have a parent or guardian co-sign their indemnity waiver.